With the increase number of internet users this questions is raised among people which site is used by most of the people. The most visited site statistics shows behaviorial and intellectural level of people and many more information related to prefereance of most of people. To make advertisement related to the online business you need to know which site reached many people as much as it can. The list of most vistied sites are occupied by most of the entertenment provider or social media and search engine. Here, the details about the most visited sites in Nepal are listed in different category. You can also see: Top Internet Service Providers in Nepal. These list include most of the news sites based on last 3 month analysis by alex based on daily no. of visiter, unique visiter and time spent by then on the site.Top 30 sites observed based on 22nd Dec. 2018 analysis in Nepal are listed below. The list may varies based on how frequently they update their content and engage users in their website.The list is temporary and it just give some idea in comparision. Few month earlier the list was another and now it's different however the most frequently reaching top list shows they are more or less popular in Nepal. Extracting from above list like Onlinekabar.com, Kantipurdaily.com, Ratopati.com, new24nepal.tv, Hamrobazaar.com, Bigulnews.tv , Annapurnapost.com, etc. are among the top ranking nepali sites and they are representing news portal. There position would remain change that depends on the engagement of people in reading, quality and qunantity of news they provide. These sites are visited from link of social medias and lots of time spend during reading news brings them in top of the list however that won't last if new updates are not availble from this portal and not shared in social media. Before leaving don't forget to follow this site and leave your valuable comment. Thank you! In this episode of arcticle I will explain about the top Internet Providers of Nepal. We may familier with some of them but it would better know about them while comparing which service is to be choosen when we have to make decision among them. There is a famous saying no one is the best and no anyone is worst while discussing about itself without comparing with others. Comparing would give many information related to each of the services of each of the internet service provider in comparision to another. It is to be sure that the so called best may not remain best when good internet service provider arrived in the market. The formal best may become worst when it couldn't compete in competitive market. The internet user are increasing day by day. The most user uses the services like facebook, Instragram, youtube.The most visited sites in Nepal would be discussed in another article for now lets moves towards the top internet Service Providers in Nepal. WorldvLinks internet service provider was established in 1995 and now it is one of the largest and quickly growing network of internet service providers in Nepal in the date today. In the 20 years of its servicing it has been reached to the high level of bussiness. Currently it cost Rs 1400/- for 20 Mbps, Rs. 1750/- for 35 Mbps and Rs. 2600/- for 55 Mbps per 1 month charge. Along with internet service provider world link as works in the field of software development, hardware sales & maintainance, web hosting & development, etc. It's network are developing in different major cities of Nepal. Vianet was establishe in 1999 and reached it's 18 years of services in Nepal recently. Vianet uses the optical fibre technology and services bothe limited and unlimited internet services but mainly focused on unlimited internet service. However on increasing the internet user others internet service providers arrised in market but since it's establishment it's providing high quality of internet to the users.constantaly. In the current date when taking an internet pack for year Rs. 13,000 for 20 Mbps, Rs. 14,000 for 30 Mbps and Rs. 18,000 for 60 Mbps. Among them 30 Mbps internet pack @Rs. 14,000 per year is popular. Classic tech is another rapidly expanding and most competitive internet service provider in Nepal established in 2009. It has become the choose for most of the users in its short period of establishment. It is one of the cheapest internet service provider in Nepal. It's home plan for internet services in current data is Rs. 900 for 25 Mbps, Rs. 1400 for 40 Mbps and Rs. 1825 for 60 Mbps price in per month. Subisu was established in 1999 and working in field of trading cable TV and cable internet. It was regarded as best in the field of internet service providing sector because of it's high speed and reliable internet service and high speed however it has not that craze these days. Internet along with TV channels are provided. It is the wireless internet services provided by Nepal Telecome. It's speed is from 256 kbps to 2 Mbps depending on range from 4 Km to 15 km. This internet service can be used in home, in office and on move. Single pack can be used in different location. It is best when other internet service provider are not in accessible location. This is privately owned telecommuniction operating GSM services in Nepal. It was re-branded on 12th March, 2010 from Mero-Mobile. It provides different internte service package to the customers in the lower price in package form. The internet service are provided in different package name. Smart Cell was established in July 1, 2008 and now it is third largest mobile network service provider. Smart cell provides different data pack for internet service user customers using mobile. The price of the data packs are lower than those of other internet providers among mobile network service providers. However it is limited to main city like Kathmandu, Pokhara, Chitwan, etc so difficulty in using internet services in areas it can't reached out. This is online world. Most of our daily life spent on it. Watching Television to spent leisure is now becoming an world fashion. However, television streaming can be watched online. So, if you have online facilities than you need not have to miss your favaorite TV program. Live Nettv is internet based live TV Steaming website. This website offers many channel free of cost of some other with few sum of money you can purchase either individual channel or the package for desire interval of time that may be for a day, week or a month. This don't let you miss your favorite TV shows or Movies. You can watch any shows any channels for 24 hours. Go to home page of Live Nettv. Click on User login in right corner and on Mobile/web in dropdown. You would be directed to Live Nettv Homepage. You can create account on it in this page. If you have already have an account you can login with your email and password for the Nettv. Here, I guess you don't have account for now. So, click on "Register Now". Now, fill up the details as shown in figure below. Careful in the spot with redmark and provide necessary details. Don't forget to Checkmark on square box in left bottom corner. There are many free channels in NetTv however if you like to purchase any channel or package for certain period of time you should have your balance in your account. You need to have eSewa account to load required amount to make the purchase. You can load from other means as well but here I will explain to load NetTv Account form eSewa. See : How to Create eSewa Account. Click on TV Payment and NetTV topup. Then enter your email of NetTv user id. and click on Check. Now the following dialogue box appear. From here you can directly purchase the package from down arrow selection. Here I am doing Topup in which you can transfer fun to NetTv as per your need not less than Rs. 10. and also depends which channel you want to purchase. This box shows your profile Name, your balance in NetTv. Select package and check box. Check on checkbox to topup. You would see some changes when checking on Topup Balance. Insert your amount to recharge NetTv account with and then click Procedd there after. Confirm your transaction. And see on: Live NetTv profile wheather you received or not. Now, you can purchase the channel of your wish. The price of CNN channel is 0.66 per day, Rs. 3.30 per week and Rs. 9.90 per month. Then click Next for confirming your purchase. There you can see the differences on the index before and after you purchase a channel. This is how you can enjoy Live Streaming of the online Televisions in NetTv. Is this artical helpful? Leave your comment below. And follow us clicking 'Follow' Button on the side ( or on the end) of the screen. Memorizing is generally the tough task in general without using any technique obviously. Have you heard of Memory Master who can quickly memorize the things and explain in front of people? Have you ever querious how would they do that? Even though you don't have any idea don't worry. Here through out the article I will be discussing on How to memorize? or about how to mastered your memorizing skills? You don't need to be wonder most of people do this technique to memorize. The system I would be explaing on this post would be based on linking System of Memory. We everybody know there memorizing is difficult with method of rot and repeat time and again. This way ob memorizing lots of clues is ridiculous. It is very difficult task consuming lots of time memorizing significantly less equvalent to nill sometimes after some time. What can be the better way to memorize in easy way quickly ??? Probably, you know the answer from the topic however not not so much idea. I will be explaing about it here below. Before that I like to remind you that there are 2 hemisphere in human brain which have different function. Right brain has brain capacity of about 90% while 10% capacity for left brain hemispere. Right Brain has function of imagination, feeling, etc. while left brain has funtion related to mathematics and logic. While you are cramming and use rot method to memorize hardly 10% you would be capable doing so as it reached maximum limit of left brain. So, you would feel tired soooner and you store very less in your brain. Today onwards you have to begin activate your right brain so abundantly you store your memory. So, you may wonder how to activate your whole capacity for memorization ??? It is simple start using your Right Brain instead. You may wonder again haven't I activate right brain till today ? That's not true but yes at least in the case of memorizing you might not use your right brain. I already explain right brain works when you are in imagination, and feeling, etc. Now, you come up to the point I guess add more imagination and feeling in the matters or subject you are memorizing. This would help to shift memorizing load on left brain to whole other part of brain. You know well when capacity is higher things go well. Same here. Built picture of any object you are going to memorize and keep linking with next one. 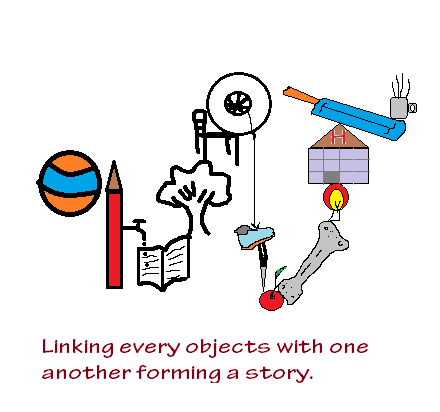 Forms a chain with forming story to add imagination and provide some feeling that would works. I would make it easier with example. Words alone may not gives you what I intended to. For an example randomly choosing I like to pick some objects. Try to remember these object with rot and repeat method and find out how many you can remember those objects. Now, we would begin using linking system to memorize these objects. After picking these object I open paints and begin drawing their sketch linking one another. The drawn sketch pic is given below and try to built your own story this time. Now your story would be ready that may different from mine. The story would help to remind next object linking after it. However, I would share the story I made. It goes like this A Ball hits a large Pencil standing on the ground. There is a tap in it's middle. Opening tap wet books on the ground. Then a tree germinate from the book tip. There is a chair on it's top. Tyre is on the chair. Shoes is hanging on that tire. In the sole there is a knife that picked an apple. When I picked an apple there is a big piece of bone, bulb in its's tip. A hospital fall from the sky over it. People are playing bats and cut of tea instead of cricket ball. This time I hope this would make you easier to rememer. It is possible because visual aids would help remembering quickly. I you feel after reading through these sections please give your opinion in the comment section below and follow us clicking follow button in right side (or at end) of your screen. Thank you. Have nice time ahead. I at least know that you have keen interest to learn Nepali typing and have came across practicing Nepali characters those directly availble in the keys while typing in Ms-word using preeti font. I have written a basic character positioning article on Learn Nepali Typing. You can review this incase needed when you have some confusion. Now, I like to inter into today's topic about the Nepali Special Alt + Code Character. We need to insert different symbols and nepali character during typing different Nepali documents. We have to stuck on this for long time even you are good typer with English character and have basic knowlege about nepali characters. Nepali Special Alt + Code Characters are actually the shortcuts used for inserting special characteristics with special code. It reduces the lengthy process and help to work faster and quicker. Some of the mainly used character which are not available in keyboard direct input would be discussed below. At first I would like to show where the shortcut Alt + code are available for the character in Ms-Word. For that you have to open Ms-word in your computer and select Preeti font before starting typing. Then, Click on Symbol on Right Side corner there appear characters you last inter in small rectangle white background box. Then click again on More symbols if there are not symbols or character you desired to insert. There you get the list of symbols from where you can insert as per your needs. You have to give well attention on this window. Look throughly from very first begining top corner to buttom corner without leaving anything. From the above table you need to notice in 5 special points. First at Symbol then on font Preeti from down arrow. Now select character (anyone for e.g. ठ्ठ ) then look on shortcut key code Alt + code for future use (e.g. Alt + 0182) and click on Insert. This steps for inserting Nepali Special Alt + Code Character is ridiculous however better when you don't have anyother mean or when you just forget the code for the character. Take help this way for getting code for shortcut to special Nepali characters. The list of Alt + Code are also listed below. I explain above steps so that you can yourself extracts shortcut key code yourself when you don't have access to given information below in the table. The Alt + keys code in light orange background gives Nepali character while others in light pink background don't give nepali character or symbols. You can record these for future work for fluent typing in Nepali. Smart Urban Technology Challenge (SUTC) is one of the initiative of Kathmandu Metropolitian City (KMC) with slogan "Our Kathmandu We build".It is organized to bring out entrepreneurial spirit within Nepalese community to identify and solve problems that arises in urban environment. It is a competition among Nepalese youths which is an oppurtunity for them to show their creativity and innovation in this platform to solve problems related to urban development using modern technology by taking geography of KMC as the pilot area. In this challenge competition each of the solution should be of inherent technology element. Thus these solution will support KMC to foster the culture to adopt smart technology of urban areas. The technology can either hi-tech or simple enhancement of process and practices that does not matter for better and tangible results used in this challenge. You can participate between the date 12th December, 2018 to 14th January, 2019 by submitting idea just clicking on "SUBMIT YOUR IDEA" button in website of Kathmandu Challenge link here. Submission of ideas should be only by team. The submitted ideas should be any one out of 4 categories: municipal administration & efficiency, community services, urban infrastructure and community & environment within the deadline through website. From the side of organizers a debriefing event on January 2 would be held where they would share information about the event and also answer the queries that participate raise about the event to clear any confusion. Competition is performed in team. Apply as a team is possible only when at least two people in a group not as an individual. You can make team from your company, a start-up company, students team from educational institute, or any informal group. If you are preparing alone team up with relevant individual to be the part of challenge. The submitted idea, concept or product can be at any stage either in conception phase, planning phase, development phase or implementation phase provided that product is not in market more than 2 years. The Features like novelty, innovation and creativity must be in idea, concept or product not the local version of existing ones. Idea most content strong component of technology not for those which are very promising but with least emphasis on using technology solutions either low or high fidelity. Team should be complete responsible for any infringement of intellctual property or legal issues related to submission, KMC won't held liable for any issues thereof. This competition is for nepali citizen residing in Nepal or elsewhere. Management of Disaster and preparedness for it. Provision related to night time services (food, medicines, transportation, etc. ), etc. Maintenance of public infrastructure like lights, roads, walkways, sewerage, etc. Management of road light and footpath, etc. Management of Supply Chain of community goods. The submitted idea, concept or product not need to look like a final products. Prototypes can differes in terms of fidelity which refers how it is presented the smaller and workable version of the real product. In this challenge technology are of two folds. 1. Low fidelity technologies: No necessarily hi-tech but can be simple enhancement of process and practices for better & tangible result that can be like Water Wheels container that can be roll from souce to settlement a effecient way to transport water and replacement of plastic cutlery by Bakeys edible Cutlery. The context of Kathmandu is to be take into consideration while designing ideas as the competition is seeking for relevant and actionable ideas. 2. High fidelity technologies: The technology that uses modern concept of information and Communication Technologies (ICTs), Internet of things, Blockchain etc. to create newer approaches to solve prevalent urban problems.This may include mostly implementation of mobile app, hardware sensors, artificial intelligence, robotics, big data, etc. The judging of the submitted ideas, concepts and products from different teams would be judge based on the following criteria. Importance of problem they trying to solve by how much. Importance of technology to solve the problem by how much and if importannt then the amount of impact of the solution to solve the problem is analyzed. Whether the current scenario or the future feabible to make any chanage. Whether the idea capable to solve portion or completely solve the problem. Whether the idea innovative or unique or an exact copy of existing solution elsewhere. Even if idea are similar based on similar concept that already exist, it should reflect characteristics of innovation and uniqueness by adopting them to local need and context. 2. Product (Weightage: 20%) Idea have no value unless it is implemented. Teams with promosing ideas should equally have promosing products too. So, aspects belows are vital to evaluate a team's product. Wheather the solution justify the idea presented. Wheather the technology features and functionalities justify problem the team intended to solve. Wheather the features of the solution innovative and useful. Wheather the technology solution look intuitive and user friendly. Whether the proposed technolgy exist in community or easu to acquire. 3. Business Model (Weightage: 20%) Idea should own its own creating business model around it. Business model is vital component for the ideas thus attributed based on following points. Whether idea provide any value to user. Whether idea really top the oppurtunities and solve unmet needs of market. By how much do the factors like Political, Economic, Social, Technological, Legal and Environmnetal supports the idea at present and future. Whether the idea capture a potential market and grow in future. Whether the idea have potential to earn revenue. The methods prepared by team to tackle possible competion in existing market at presernt or in future. The methods prepared by team to market their product. The plan for their sustainability. Whether the idea feasible for the team to scale up to another location other than primary in future. The methods to assess scalability at an international level. The preparedness of team to scale up. The overall presentation of idea. Whether the articulation clear enough to understand idea and product. The organization of the presentation. Whether the supporting materials help to convey the idea clearly. This way Smart Urban Technology Challenge ends. Smart Urban Challenge 2018 is new concept to solve urban problems. Smart Urban Technology Challenge 2018 would brings innovative ideas from different people togather. Wish you would present your ideas in Smart Urban Technology Challenge 2018. At the beginning days of learning Nepali typing it is hard to know which key contains which Nepali character as most of the keyboard are not Nepali character friendly. But often we need to get through typing nepali document. Being the citizen of Nepal of this 21st century we most have knowledge about at least Nepali typing. The typing speed won't matter that raises when we keep on practicing. Here I will gives very important ideas that would solve most of your trouble related to Nepali typing particularly very basic issues. Typing in Nepali unicode i.e. under Nepali typing in unicode heading. Either you can directly skip to your desire heading or go througly for details. I can assure that if you are completly unfamilier about Nepali Typing then also don't worry. It would help you to learn rapidly without lots of stress. I also have follow same strategy or methodology to get experties in Nepali Typing. Only you need to have though and time to Learn Nepali Typing. If you provide your kind attention I begin to share the ideas. All this ideas based on phonetic sound i.e. all related with speech sound. You need to pronounch the same way I guided you or you can create similar to that you don't just forget. This is just an idea but I found this one most effective to me and though it would be to you as well. In this method I formed a nepali word from joining phonetic sound of english alphabet in keyboard and with nepali character lies in same key. Let take a example starting with first English alphabet A. The Phonetic sound of A is अ and the nepali character lies in same key is ब. So, it forms Nepali word अब. It would help you to remember nepali character from English Character of Keyboard. *Note: Here, I am teaching you locating nepali character from english alphabets keyboard. The position of Nepali character varies with different typing language but in general almost 99% uses this system excluding romanized way of typing. # During learning process I advice to use Microsoft word. Learning only positioning of some Nepali character we would be expert on Nepali Typing howerer it is the first step to Learn Nepali Typing throughly. You can't remember just looking all character easily come on I gona make it easier to every character of the keyboard. The above table shows the basic(primary) nepali characteristics. These primary character are those which can be pressed with single key. Secondary Characters are those characters which are formed by the combination of two or more keys. Now, I like to introduced with the shift + keys. Shift + keys are given below. Shift + , = ? There are more than these symbols in Nepali Character while typing. For more advanced learning about Nepali character you can go to advance Nepali character representating symbols. 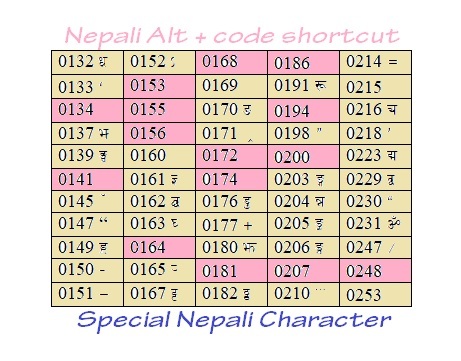 Shortcut keys to various other nepali character would be discussed there. 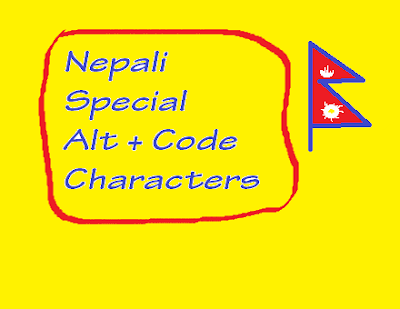 For details about Alt + code special Nepali characters or symbol See on: Nepali Special Alt + Code Character. If you Find this post helpful please follow us clicking follow button on right side (or at the end) of the screen and leave your comment.